Love it. (our cats do not sleep together). 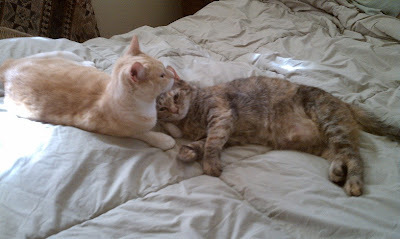 Love the kitties loving on each other! I have a house-full of freak shows. They all hate each other! I am jealous of the kitty pile. My turn to say "OMG! Cute!" Oh my, how absolutely precious! How adorable. My cats would NEVER do this. They have their patch and god help the other kitty who strays into that patch LOL. But then again I am in a warmer climate so dont know if that makes a difference. I love it when my furry children cuddle with each other!! So sweet! They make me want to cuddle with them. Aw, I want to cuddle with them. Adorable! I so wish I wasn't allergic to cats right now! Thank you all for your wonderful comments! This is one of my favorite photos of the two. They do fight occasionally as I'm sure all siblings do, but they also have their moments where they're quite loving towards one another. Awwwwwwwww... they're so lovey-dovey together. I love this picture, Wendy!